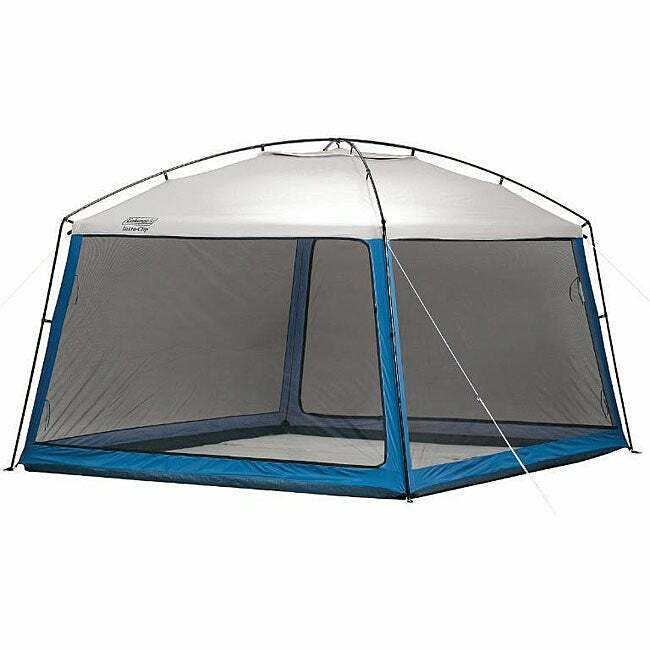 Thinking about buying a screen room shelter - does anyone use one? If so: can they advise of the pro's & or con's - or make a suggestion as to the best one to buy and where. What is your intended use for it. Chapi? I have a Coleman one from Canadian Tire that works quite well, but is really too large to haul around everywhere, unless you know for certain you will be setting it up. You can actually fit 2 full sized picnic tables in it. Click on photos for link. If you are looking for a smaller one that will seat a few people, and maybe a small table, there are a few from outdoor suppliers that are intended for backpacking and canoeing that would take up way less space, and way considerably best. I have that Coleman Insta-Clip model also. I bought it when we desperately needed a screen room for mosquitos and this was what the hardware store in the small town we were in happened to have. You have to be certain to get the support poles put together exactly right, and even then it's wobbly until you get it staked down. I wouldn't use it without the four corner guy lines, either. It is roomy, and is tall enough to have a lantern on a table-mounted pole. Carrying it isn't a problem for us, it goes in the truck bed. Looked at a different Coleman model yesterday at Costco, fairly inexpensive ($169), but it was outrageously too heavy because it had that heavy expanding internal frame. I've seen a few Wenzel models at campgrounds, and am leaning towards one of those. They're hexagonal and sturdier, I believe, as well as being fairly lightweight. Yeah, I find the same things with setting my Insta-clip up. The poles are not too stable until tied out. I bought mine too on a whim when desperately needed too, and never really looked around. I too am on the lookout for a lighter unit around the 10'x10' size. I just may have to set up my Escape screen room for the first time at the Osoyoos rally. At least Reace and Tammy will be there to show me how ( again ). I've had it for four years. Our used 2005 17B came with a screen room and the original owners hadn't used it once! Honestly, living in the NW, I doubt we'll ever use it either, so we moved it into our garage. It was rather cumbersome to leave in the trailer all the time. I think if we were camping in crazy mosquito country, or were setting up in one spot for more than a couple days, we *might* use it, but only in specific circumstances. If you really want one, I'd recommend something light, small and easy to set up like the backpacking ones! When we run into a mosquito problem we leave. If we left because of bugs or weather, we sure would not make it out with our trailers much. That must be why my trailer is still in the driveway. I want to go up to the Cariboo / Chilcotin, but the Old Bag says I can go by myself and test the screen room. Blackflies, Horseflies and mosquitoes. Yum. Which reminds me of the fly fishing guide who had a dude and his blonde accessory on a trip. The blonde complained that there were too many bugs on the river and wanted to go back to the lodge. I'm just saying that if the mosquitos got so bad I had to set up a screen room and stay in it I'd sooner move on. There's always bug spray for the few nights we've been bothered.